Don't miss a step! Go to the store or take walks in the park. It is a proven fact that an active and independent lifesyle has many geat physical and psychological benefits. Nova Ortho-Med walkers will promote this healthy lifestyle by making walking easier and more natural. 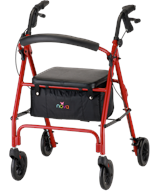 We offer a diverse line of walkers so you can select the right model for your individual needs. HEAVY DUTY AND LIGHTWEIGHT ROLLING WALKERS - SPECIAL DISCOUNT PRICES! Basket Covers, Travel Bags, Drink Holders, Etc.